Table of Contents: History of Nova Scotia, Book 2. 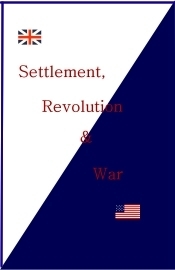 Part 1 -- "Pre-Revolutionary Settlement (1760-76)." Part 2 -- "Revolution And The 14th Colony (1760-83)." Part 3 -- "Post-Revolution -- The Loyalists (1782-90)." Part 4 -- "Nova Scotia at the Turn of the 19th Century." Part 5 -- "The War Of 1812: Eastern Theatre."